their expertise as a 'Catalystic Associates' in the "Catalystic Entrepreneurship" Project. they will be the pioneer and lead the project "Catalystic Entrepreneurship" in every Indian district. We will transform our "Catalystic Associates" into a Diversified Entrepreneur as well. What will be the reward! We have balanced nutrition to nurture our Catalystic Associates! This one is a primary concern point for entrepreneurs that what will they get in return? We have many monetary and non-monetary benefit(s) for you as a Catalystic Associates. Due to our extensive exposures and experiences into the business, we have a vast robust network to share with our Catalystic Associates. We have top leaders, entrepreneurs, corporate and entrepreneurial celebrity partners, endorsing this project including Robert Kiyosaki, will be train you for your better future in diversified niches! Money, Mentors, Hand-Holding, and Network is the strongest foundation and condition to build legacies for any individual, entrepreneur, corporation. You will get here all. investment, income generation, exit period policy, and exit benefit(s) on refundable investment. For Catalystic Associates we have low level investment criteria. The entire amount of investment is refundable as per exit period criteria with added benefit(s). Every entrepreneur focuses on recurring and scalable income streams of income/profits! We have this desirable opportunity for our Catalystic Associates. If any of our Catalytic Associate found in the near future that this is not a good fit for them, they can easily exit after some intervals with 100% of invested amount. When you will take the exit, we will refund all your invested amount as per the terms of the agreement with bank interest and any announced benefit(s). we have two kinds of consideration for our Catalystic Associates i.e Monetary & Non-Monetary! Up to 0.5% (Recurring and Scalable). Our Network includes Investors, Equity Investors, Angel Investors, Venture Capitalists! Network and connections are the key of enhancement into your career. Our network exposure and mentorship will enhance your CREDIBILITY & GOODWILL over the period of time! Up to 50% discounts on courses, summits, seminars, events etc. redeemable coupons on other purchases.. There is an undeniable truth; "without the support system nobody can reach his/her maximum potential". We are committed to provide unbeatable SUPPORT SYSTEM to our "Catalystic Associates". It will help you to understand! Training is the first step in order to get desired success! We are committed to provide 'Project Specified' training to all our "Catalystic Associates" across organisation. We have a set weekly "Live Sessions" specifically designed for Catalystic Associates. Where you will ask concerned questions & give suggestions for betterment etc. Our founder Mr. Rajiv Chand ensures to meet each and every people in the organization. He is continuously visiting all associated entrepreneurs in many states in India. We will arrange "Group Training Sessions" at your District or State on his monthly/weekly visits. There are so much to learn and apply with our "Catalystic Entrepreneurship Project". It will also help in your overall development. We only need your commitment to learn and rest we will take care of! It will help you to explore! Exposure is mandatory to get noticed all over the place! We have a planned strategy to promote our project "Catalystic Entrepreneurship" and services. *Celebrities like Robert Kiyosaki, Brian Tracy etc. It will help you to build! Every organisations have a culture and tribe. We have too! It is mandatory to have a culture, team and tribe of like-minded people in order to succeed in the mission. We are a country focused organisation which is above all caste, creed, religion. We have a simple culture to follow. Like minded people always do big turnarounds with dedicated leadership; they build a great nation. The society, youth, entrepreneurs, & economy. Connections plays a vital role in success of individual, association, business, economy etc. We are building a unshakable foundation for India to compete in these dynamic times, in the guidance of Rajiv Chand (having in-depth exposure of rural & urban India). We have a diversified concrete plan for our expansion across India! Figure it out as per your geographical location. Must indicate your district in the "Enquiry Form"
*Subject to requirements, we may increase or decrease it according to the demand. Right now it is "2 Catalystic Associates" per district. *We considered Delhi in North India due to its National Capital status. Asking a question or a bunch of questions shows keenness & interest over the topic! Here are a few questions answered which will make you more aware of the offered opportunity. 1. What is the eligibility to become "Catalystic Associate"? * These offerings are for Indian Entrepreneurs & residents only. 2. Why the company is charging an "Investment Amount"? Look, there are people all around seeking "free things" all day long. They want to build empires without investing a single penny. They don't pay attention, they roam everywhere to test every known thing or shiny object in order to get success. This attitude leads them to huge failures and depression. So, as per our vision and mission, we are committed to equip, mobilize, and train our Indian entrepreneurs and youth to strengthen Indian economic conditions. It will help you to understand the importance of seed money and build your attitude towards it. (1) they collect money from people and don't deposit it into the company. (2) they make false promises to qualify the leads. (3) they cheat people by forged documents of the company etc. ATTENTION PLEASE: If these kinds of practices happen at the end of our any CATALYSTIC ASSOCIATE(s), we will adjust their invested amount with that loss/fraud/manipulation etc. alongwith FIR. It will also avoid non-serious candidates. 3. Whether my investment safe? Yes, your investment is safe with a contractual agreement. 4. Can I quit before 12 months? No, you can't quit before one year. This opportunity is 'hard-core' business which demands lots of hard work, dedication, and patience. For the first 12 months, we will spend more than of your investments; as well as time, resources and efforts on you. So, you need to stay with us for a minimum period of 12 months. In this period you will learn secrets of practical entrepreneurship and you will have a platform to implement those secrets accordingly. 5. Whether I need to maintain an office to start with? No, you don't need a physical office for starting. You can start it with your home or existing office (if any) + PC/Laptop + smartphone. Later you can use our nearby "Franchises" as an office. 6. Whether I will get my invested amount without any deduction? Yes, you will get your invested amount without any deduction(s). But, we will deduct TDS on added monetary benefits at the time refund of the invested amount. We will provide you concerned Form-16 in respect with TDS. 7. What kind of benefit(s) I will get on exit? Note: Above mentioned benefits are subject to the deduction of TDS and revenue obligations (whichever is applicable). 8. What if, when the company denied the refund of my invested amount on expiry of terms? Smart question, we appreciate you asked it. Look, any offering backed up with "Contractual Agreement" is bound by the "Indian Contract Act 1972, is a strong proof or evidence in your possession that company will return your "invested amount" on exit after prescribed time frame by mutual consent. Which you can legally challenge in the court on the denial of the invested amount. Disclaimer: If you forcefully exit without completion of prescribed time frame, you will not get any refund. 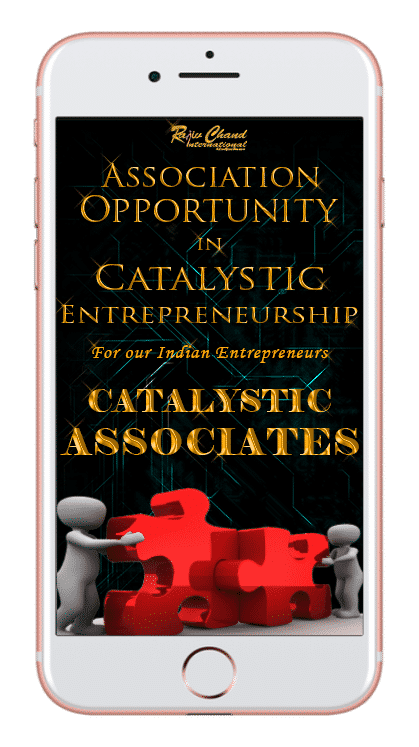 Our business and aforesaid "Catalystic Associates" opportunity is not a “get rich quick” scheme. Please read our disclaimer very carefully before taking any economic and business decision.